When you’re starting your career, you are looking for place you can grow, thrive and really make an impact. McCarthy offers the best opportunity in the country for new graduates — a chance to start your construction career as an employee-owner and never look back. Since becoming 100% employee owned, we’ve been attracting the top grads who not only want to build the most interesting, exciting projects in the country — they want to build a strong and rewarding future at the same time. Are you up for the challenge? Whether your passion is operations, safety, design phase services or VDC technology — McCarthy will support you in discovering your personal path to success. Our thoughtful yet aggressive career growth strategy will help get you where you want to be. As the #1 ranked construction training company in America, we will help you learn to do it right from the get go. 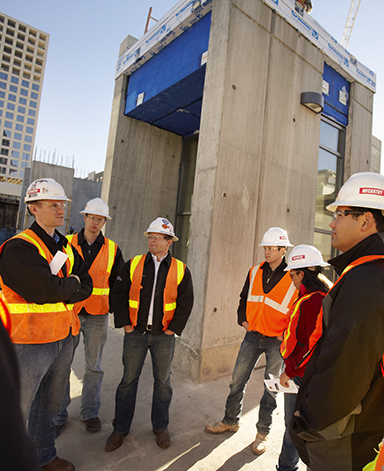 Surrounded by the best building professionals in the industry, Safety and Quality and the principles of operational excellence will all be a part of your new career. From the most sophisticated hospital operating room to a sprawling solar field, our projects are as diverse as the people who build them. One thing that never changes is our commitment to a team approach. Our Core Value of ‘We, Not I’ means that we are in it together, as owners and partners, and when you need support, you’ve got it.